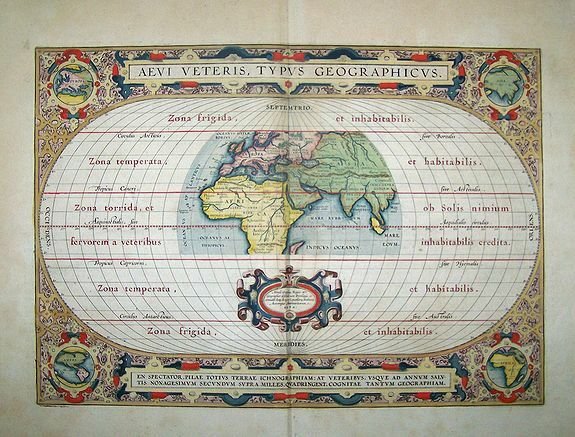 Title : Aevi Veteris, Typus Geographicus, . Map maker : ORTELIUS, A. Size : 12.4 x 17.5 inches. / 31.5 x 44.5 cm. Description :Ancient world map depicting the area of the earth known in classic times. The map occupies the central section of a larger oval projection and extends as far east as Sumatra and south to Madagascar. The map is surrounded by a richly ornate border incorporating four small insets: Europe, Asia, Africa and America representing the modern world. Seventeen classical authors and their works are specifically mentioned. Later discoveries prior to Columbus, viz. In the South and East Asia by the Portuguese, and in the North by Richard Hakluyt are also referred to. Abraham Ortelius is regarded as one of the finest cartographers from antiquity and certainly the most prominent of the 16th century. His concern for accuracy and attention to detail make his beautiful old maps both intriguing and aesthetically pleasing. from the Latin edition (page viij). Condition : Paper slightly age-toned. Very good condition, wide margins.